After the slide adders of Claude Perrault, Caze and Heinrich Kummer, in 1889 the frenchman Louis-J. Troncet (b. 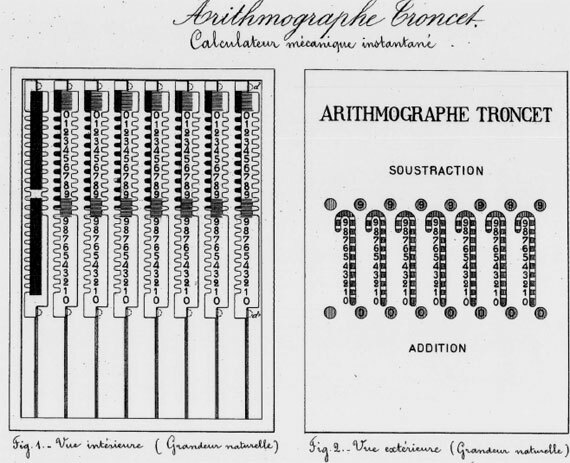 1850), a teacher (in Buzançais, département de l'Indre) and director of a school (in Reuilly), created his version of this type of calculator, which he called the Arithmographe. Troncet's invention became so popular that the term “Troncet-type” is often used to refer to this class of devices. The device was in production almost 30 years. Millions units of this type were sold. It was on the market until the 1970s. Louis Troncet was a holder of four french patents: №123135 from 1878, №133106 (1879), №171473 (1885) and №197579 (1889) (never published as fees were not paid). 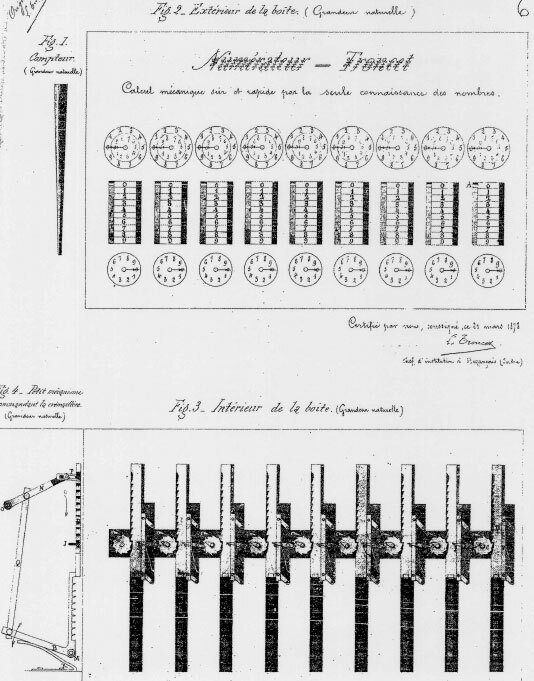 The first patent (from 1878) was for a slide adder with dials, called Numerateur, which has never been put in production (see the lower patent drawing of the device). The devices of Troncet are typical of the small, usually hand-held, stylus-driven adding machines. They are often known as crook or cane adders, because of the shape of the input slots. The operator moved a stylus up or down the slot n spaces to add or subtract the digit n. If there was not enough space to move n places, the stylus was forced to go over the hook and effect a carry to the next digit. The next three patents are for different versions of the Arithmographe (see the patent drawing of the third version from 1889). Namely the third version of the Arithmographe (see the lower photo) featured so clever and reliable construction, that became a market hit in the end of 19th and the beginning of 20th century. 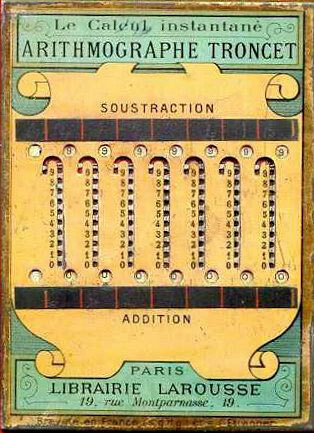 First devices have been produced by Librairie Larousse and were sold normally in a small notebook with a set of multiplication tables. The dimensions of Arithmographe are: 10 x 13,6 x 0,5 cm. 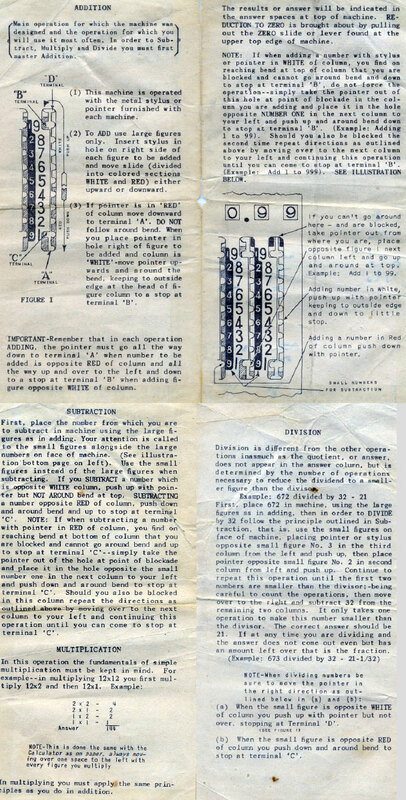 A good description of the workings of the device can be seen in the manual (see the lower image) from a very popular in the US analog of the Arithmographe, the Baby Calculator. The Arithmographe of Troncet used flat metal bands with notched edges to represent digits. These bands were moved with the stylus to enter numbers. The instrument has seven crook-shaped columns that reveal the edges of eight notched bands. The crook at the top of each groove is designed to ease carrying or borrowing. Eight holes below the columns, labeled ADDITION, show the results of addition operation. Eight holes above the columns, labeled SOUSTRACTION, show the results of subtraction operation. There is no zeroing mechanism. 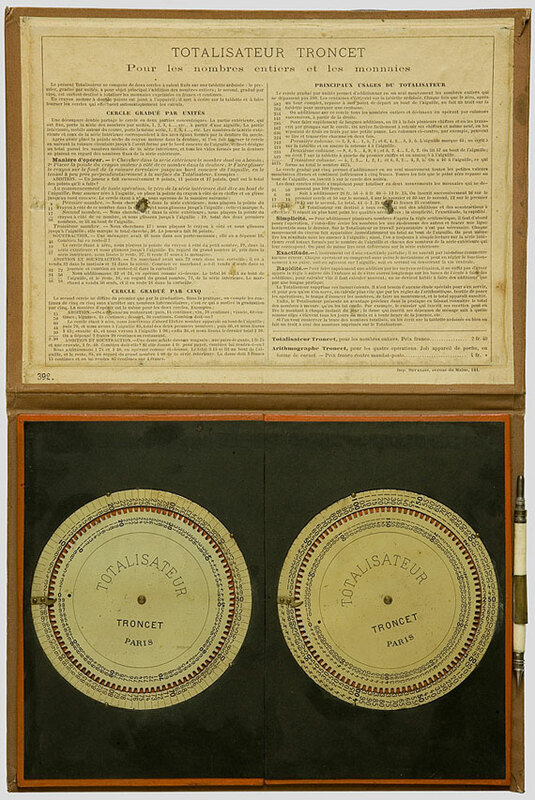 Troncet manufactured and sold also another calculating device, so called Totalisateur (dial adder) (see the lower photo), which was a circular adding device. It however didn't became a market hit, in contrast with the Arithmographe.